Salamanders, fish and perhaps even humans are evolving fast in response to toxic chemicals. Is that bad? In the hemlock and oak forests of northeastern Connecticut, Steve Brady stood thigh deep in black muck and scooped up a handful of spotted salamander eggs. A Yale PhD student, he had once fancied himself zipping across tropical waters in a Zodiac boat or scanning rainforest canopies in search of exotic birds. Instead, he had just planted his budding career as an evolutionary biologist in a muddy ditch. The eggs, nestled in a protective jelly stained golden by tannins that glistened in the light, might have looked like any other clutch of salamander eggs from a woodland pond. But they weren’t, and this was no pristine sylvan pool. It was a roadside puddle, and those eggs promised to contain something unsettling. If Brady was right, the toxic brew associated with road run-off had forced the spotted salamanders to evolve in the space of decades. In the time since Neil Armstrong first set foot on the moon in 1969, these animals had been reinvented by nature to cope with life on the road. Adult salamanders, slick black with their brilliant yellow spots, thick tails and deliberate walk, already look like creatures from a B-movie. And while the chemicals that might be responsible for their evolution are a far cry from atomic radiation and other horror film toxicants, Brady’s research suggests that this basic scifi premise — rapid evolution as a means of surviving exposure to toxic chemicals — is rooted in reality. Roadside ponds are a harsh place to rear a family. ‘The chance of survival in roadside pools is much lower than that in a woodland pool,’ Brady told me. ‘Even in adapted populations, a little over half the eggs survived the first 10 weeks of development.’ That’s a major hurdle, especially for wetland amphibians that already face intense natural challenges. As Brady observed: ‘These pools frequently dry up before the animals have reached metamorphosis, leading to the loss of an entire generation.’ And as the pools dry up, the contaminants in them — metals and salts, for the most part — become concentrated and increasingly toxic. Curious about how populations could survive such harsh conditions, Brady devised an elegant reciprocal transplant study: a sort of Switched at Birth for salamanders. The set-up was simple: several dozen shoebox-sized salamander egg incubators, some glue and some duct tape. Brady collected freshly laid eggs from both woodland and roadside ponds. He then put subsamples of eggs from each environment into woodland water and others in roadside run-off. He watched how the creatures fared through hatching and their early stages of development. 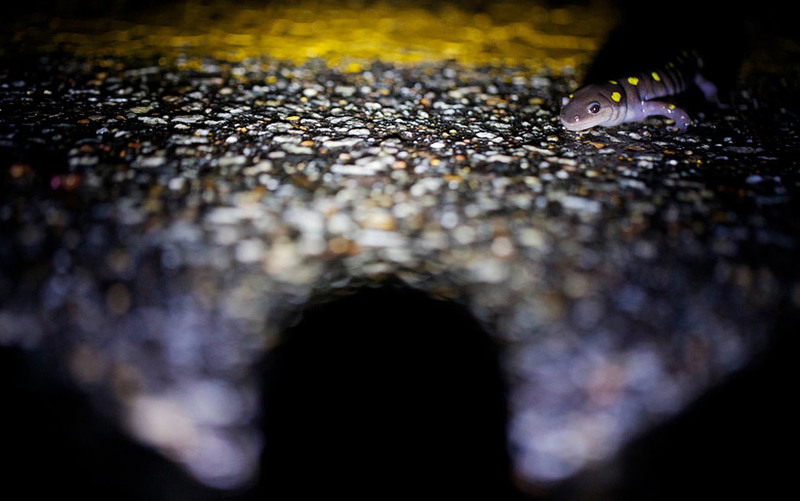 In the end, the roadside salamanders out-survived woodland salamanders in a pattern that suggested the roadside populations had become locally adapted to their harsh conditions. Years ago, my own research investigated a similar phenomenon. I focused on a common biological marker of exposure to dioxins and similar chemicals. Dioxins, like other organochlorines, including polychlorinated biphenyls (PCBs), are the product of a marriage between carbons and chlorine. Rare but not absent from nature, they occur most often as a by-product of industrial processes (paper bleaching, for example, or the combustion of plastics). Their persistence and broad spectrum toxicity, not to mention the poisoning of the former Ukrainian president Viktor Yushchenko, have solidified their reputation as one of the most notorious industrial-age pollutants. I knew that if either dioxin or dioxin-like chemicals were present in the environment, any organisms exposed to them would show increased levels of a particular enzyme, along with toxic symptoms of the chemicals themselves. But a few studies had suggested that this enzyme and associated toxicity were suppressed in populations of killifish (a minnow-like species) inhabiting highly contaminated sites. Intrigued about this resistance, a couple of colleagues and I designed studies a little like Brady’s to find out whether it was heritable. Unfortunately, our studies took place in the wilds of urban New Jersey rather than the country roads of Connecticut. After months of planning, building cages, and collecting and placing fish, our test subjects disappeared, cage and all, over less than a week. Either the contaminants were capable of inducing more evolutionary changes than even we had imagined, or else someone thought the risk of wading into ooze brimming with PCBs and dioxins was worth a few sickly minnows. Dejected but undeterred (there was the matter of promises to a granting agency, after all), we retreated to the safety of the lab and squeaked out a couple of studies suggestive of inheritance. Yet without those transplant studies, we could make no declaration of evolutionary adaptation. Decades later, following a series of painstaking studies, the aquatic toxicologist Diane Nacci of the US Environmental Protection Agency and colleagues including Andrew Whitehead from Louisiana State University confirmed that the minnow populations we once studied had indeed evolved. So, in fact, have other contaminated populations all along the east coast. The New York University geneticist Isaac Wirgin and colleagues did some further work with PCB-contaminated Hudson River Atlantic tomcod. Not only did they confirm evolution in response to PCBs, dioxins and similar chemicals, they also identified some very specific genetic changes underlying these adaptations. We are used to thinking of evolution as the descent of man: the interminably slow and meandering transformation of life from single cells to complex sentient beings, one random mutation at a time. This is evolution writ large. But large changes are often the manifestation of myriad small but significant ones, and these can spread through one population and then another within our lifetimes. This is evolution writ small. It is as old as life, but it is a phenomenon that we have been slow to grasp — often to our detriment. When Alexander Fleming won the Nobel Prize in 1945 for discovering penicillin, he warned that using the drug too freely could lead to resistance. Five decades later, we are grappling with the aftermath of indiscriminate prescription and feedlot antibiotic use. Ever more pathogenic bacteria are becoming immune to our drugs. According to one study, more people in the US now die from staphylococcal infections than from AIDS. Fleming could not have known the genetic mechanisms that lead to resistance as we understand them today. But he understood the implications. Persistent sublethal exposure to toxic chemicals is enough to drive the evolutionary process. Many of us know the story of the peppered moths of early industrial England. As trees became blackened with soot, the darker populations of the moths survived, while the lighter ones perished because they were easier to spot. Later, the process reversed as environmental controls reigned in the release of sooty particles. Instead of serving as examples of rapid (or, more accurately, contemporary) adaptation, these darlings of biology texts used to be presented as an odd case of evolution induced by human activity. Those moths now have plenty of company, including antibiotic-proof bacteria and pesticide-resistant insects, from mosquitoes to bed bugs. Until the end of the 20th century, most observations of contemporary evolution were limited to species with amenable life histories. Intergenerational studies with bacteria can take place over days. Insect populations, whether lice, bedbugs or mosquitoes, can be explosive in the right conditions. Vertebrates, by contrast, tend to have long generation times, seasonal reproductive cycles, and small broods. That makes them difficult subjects for researchers whose careers depend upon a steady flow of publications and whose research follows a tenuous grant-cycle. Demonstrating contemporary evolution in vertebrate species, particularly among wild populations, can take decades of painstaking observation. There is little room for mistakes, let alone a missed reproductive season. The growing number of species introductions, invasions and toxic chemicals is, however, providing plenty of opportunity for observing changes even among our slow-breeding vertebrate relatives. In the latter part of the 20th century, several long-term studies came to fruition, not least a groundbreaking series of papers by the biologists Peter and Rosemary Grant, who charted shifts in the beak shape and body size of Galápagos finches over a 30-year period. Even so, such rapid evolutionary change in vertebrates still seemed the oddity. In the early 1970s, Stephen Jay Gould and Niles Eldredge proposed that large-scale evolution occurred, not through constant gradual change, but through an ‘accumulation of discrete speciation events’ combined with periods of stasis. One aspect of this idea was that standing still was an active process. Because genetic change occurred naturally and randomly, there was a tendency towards constant change. The absence of obvious changes for long periods suggested that there had to be a countervailing force: the system had to be doing something to maintain genetic stability. But is it possible that the genomes of vertebrate populations are not as recalcitrant to change as we once thought? What if they harbour subtle genetic variants, like ghosts from environmental challenges past, offering a degree of flexibility in the face of change? Perhaps, like the peppered moths, the finches, killifish and salamanders are harbingers of discoveries to come. It might even be that rapid evolution in response to toxic chemicals is quite common. A further guilty question suggests itself. If life can adapt, why bother with expensive environmental cleanup? Why not let nature take its course? The absence of evidence certainly doesn’t indicate evidence of absence. Yet the disappearance from contaminated riverbanks of species such as the American mink, which is known for its sensitivity to dioxins, might suggest a failure to evolve. And in mink there is good reason to believe this is true: these chemicals disrupt reproduction, a fairly important step in the evolutionary process. What about other species in Brady’s ponds? What about the wood frog, whose click, clack, quacking keeps us awake on spring evenings? When it comes to the salamander’s amphibious compatriots, says Brady, ‘we have seen very different outcomes across species in terms of their ability to adapt to these pools’. He guesses that adaptation is more widespread than we know, though ‘by no means the rule’, and expects that different species respond in different ways. Following another set of transplant studies, Brady finds no evidence of adaptation in wood frogs. In fact, roadside frog eggs are even more compromised than woodland frogs when placed in contaminated ponds, and they don’t do so well in woodland ponds, either. Brady suspects that the roadside populations are sustained by young frogs filled with wanderlust and a thirst for more urban mating, which leads them to set up home under less than favourable conditions. Wood frogs and mink are just two species. Even so, they raise important questions about how and where life is most likely to evolve its way out of a toxic situation. Evolution in response to food shortages or naturally changing environmental conditions, as in the case of the Grant’s finches, is one thing. As long as there have been finches, they will have encountered periods of plenty interspersed with scarcity. It makes sense that survival requires some degree of flexibility. Sometimes, though, such flexibility can’t stretch far enough. When a population finds itself outside of its comfort zone, what’s known as a mismatch occurs: traits evolved in one environment (say, run-off free ponds) are no longer useful in the new conditions. Increased evolutionary mismatches might be a hallmark of this age of humans. And while a population might overcome a small mismatch, it is much more difficult to overcome a big one. Whether it succeeds will depend both on the nature of the environmental shift and on the species in question, as well as its evolutionary history. But what is extraordinary about the changes observed in fish and now salamander populations is that they are responding to uniquely human selective pressures. Stranger still, distinct populations within the same species seem to be undergoing similar changes. Evolutionary adaptation requires genetic change. One fundamental step in the evolutionary process is mutation: some alteration in the genetic code that in turn alters the capacities of the organism. If these events are not lethal at the outset, they might disseminate throughout families, particularly if they enhance reproduction and survival. But these changes don’t have to arise spontaneously. Like a once-favourite sweater hiding away under a more trendy pile until it is rediscovered on a spring day decades later, genes once favoured in the past can lurk in the genomic background until called upon. Such ‘standing genetic variation’ might explain how salamanders adapt rapidly to road salts. It’s not a stretch to imagine that a species that survives in pools which come and go with the season, and which naturally become concentrated as the weather warms up, might have the genetic wardrobe to cope with increasing salt levels. The question remains: are we exposed to industrial toxins that are sufficiently persistent, powerful or widespread to nudge our own evolution along? So, just what is the capacity for contemporary evolution? Can any species do it, or are some more likely than others to evolve? And if they are, what can we learn from them? Perhaps they are simply more prone to mutation. Perhaps their populations are more diverse, equipped with a larger pool of genes capable of weathering all sorts of environmental stresses. Recent studies by Nacci and Whitehead suggest that this is the case with killifish, which tolerate large differences in salinity and water temperature (and can withstand a night spent flopping about in the dampened trunk of a university car, as I happen to know). What isn’t yet clear is how this translates into tolerance for industrial-age chemicals such as PCBs and dioxins, which were exquisitely rare before the last century. We do know that these substances act through a certain receptor and that mutations in the receptor are responsible for resistance to these otherwise toxic chemicals. That leaves the mystery, yet to be solved, of this receptor’s ‘normal’ function. What does it do, and why does it exist in the vast majority of cells in living things from nematodes to humans? One only needs to skim the daily news to know that we too are breathing, bathing and ingesting chemicals the likes of which our ancestors never knew. Relatively rapid evolution is not unknown in humans. One of the most cited examples is lactose intolerance, or rather tolerance, for which many of us can thank a set of old genes that turned out to be beneficial for pastoral cultures. Even there, though, we aren’t talking decades or a century for the adaptation to spread; it took many generations and perhaps thousands of years. Some even doubt that humans are still evolving. Might we have stepped so far beyond the bounds of nature that we’ve interfered with our own evolutionary process? To some degree, human culture, medicine and technology have indeed let us sidestep natural selection — a good thing for all those of us who might not otherwise have survived. Even so, according to the evolutionary biologist Stephen Stearns and colleagues, we have not yet become an unchanging species. ‘Traits in many human populations,’ they write, ‘are subject to natural selection, and have the genetic potential to respond to it…’ At the very least, certain characteristics (height, for example) remain susceptible to selection, which means that we have not yet become a post-evolutionary species. And that’s a relief. For a species to cease evolving, its survival and reproductive success must no longer be under genetic control, an unsettling prospect given how well these interactions have served life for at least the past 3.5 billion years. So we are evolving, though perhaps not so rapidly that it is detectable within a few generations. And even if we could evolve as rapidly as a killifish or a salamander, the question remains: are we actually exposed to industrial toxins that are sufficiently persistent, powerful or widespread to nudge our evolutionary process along? The consequences of not adapting to roadside salt are clear for salamanders — reduced fitness. What toxic selection pressures are acting upon us? The good news is that we have limited our exposure to some industrial contaminants. PCBs were banned in the 1970s, and the production and release of other halogenated organic chemicals are, if not restricted, at least under scrutiny. Yet there are tens of thousands of industrial chemical contaminants, and we are continually releasing new products. In the classic monster movie scenario, chemicals cause transformations directly, stimulating horrifying mutations. In the wild, as we have seen, toxicants tend to work more subtly, imposing additional conditions on survival and challenging life to either draw upon existing genetic variation, or win the genetic lottery through favorable mutation. Yet the connection between toxicants and evolution can be even more mysterious than this basic picture of natural selection suggests. One complicating factor comes from the developing field of epigenetics, the study of heritable changes in gene expression, which is giving us strange new insights into the evolutionary process. It turns out that lifetime experiences such as environmental stress and diet can alter the way genes are expressed, and these changes can be passed down to subsequent generations by purely biochemical means, without any alteration of the DNA sequence itself. This process, reminiscent of the ideas of Darwin’s old rival Jean-Baptiste Lamarck, opens the door to a kind of heritable change that is heavily influenced by a single generation’s environmental conditions. And so we now confront a possibility that is both intriguing and deeply troubling. Industrial chemicals might have effects that are widespread and heritable, yet also maladaptive, not only in humans but in all life on earth. Epigenetics is extending the modern evolutionary synthesis into uncharted waters. When it comes to rapid evolution, we might not encounter pressures such as those that shaped Steve Brady’s roadside salamanders or PCB-contaminated killifish. But we certainly have not escaped the chemical gauntlet. We might yet experience a far more insidious kind of rapid evolution through chemically induced epigenetic alterations. How these will influence the evolution of human populations is anybody’s guess. Perhaps they will be of little consequence. Perhaps the outcome will be so egregious that carriers are eventually weeded out. Stabilising selection might prevail. Or perhaps, humans in the not-so-distant future will become unwitting actors in a real-life science fiction, fending off hoards of fecund, rapidly evolving chemical-resistant pathogens and insects, even as we are weakened through the accumulation of myriad changes of our own making.